Okay, I was thinking about this for a while now. Instead of making a new thread just for, example, "How much does a hood cost? ", you could just post it in this thread and someone will answer the question. So any short and simple questions just post them here. So if you guys like this idea, maybe make it a sticky thread...? So I guess I could start off how long is the "Impala" badge that was on the side doors of the '03's? If i get an ss cluster do i have to program the mileage? whats the wheel size that fit impalas 2000-2005? 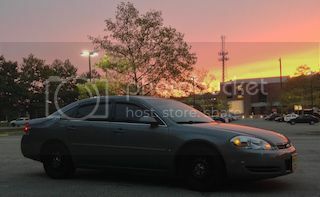 Has anybody tried putting HIDs in their 06+ Impala? Yes, DDM tuning is the most popular. Will it be tough to disable my DRL? No, they are disabled with a pull of a fuse. Does Customer Service on this board actually help with anything? Very simple and stupid question, is the key for the ignition supposed to work for the door? I got two keys when I bought it, and neither work for the door so I have been using keyless. I'm assuming that the lock is just eff'ed, any idea on the best way to correct that? Replace the lock my self or take it to a pro? hmm interesting. im pretty sure that should be the same key. i would have someone look at that. even if you replace the tumbler yourself, you will still need a locksmith to "key" it to your key, so one way or another you need a pro, might as well have them do the whole thing..
Yeah thats what I figured I should do, just gotta make sure my keyless fob dosen't die before getting around to it. Swapping the lock isn't hard or time consuming, but yeah, it would need to be correctly keyed first. Till then keep an extra battery in your wallet. So how much does a stock hood for a 1994 Impala cost anyways? Where's the cheapest? A new one and not a junkyard or scrap car one..
Price will vary, ebay, CL, forums are good places to look. Check the ISSF forum. Is there even any aftermarket support for B-Body replacement body panels? I'm thinking like, the "LMC Truck" type support for the 6th gens? Or is it all NOS/junkyard/partouts that a person has to look forward to? I have a '94 Caprice (ex Law Enforcement model) sedan that has had lowering springs put on the front. It looks good, but drives terrible. I want to put the original springs back on, but would like some instructions, printed or video. Thanks! I got mine for like 150. Can't remember where though.